On the surface, it appears to be everything nonprofits would want - the ability to solicit donations directly through Facebook! 501c(3) registered charities can now set up fundraising campaigns on Facebook, collect donations, and encourage people to get involved by creating individual fundraising pages. Facebook's donation tools may seem convenient, but we don't yet have the full picture of how they fit into your overall online fundraising strategy. You could be missing out on valuable data and donor retention opportunities. Here are a few questions you should be asking as you vet Facebook's tools! How does our charity get donor information? Do we receive donor name, email, or addressing info for follow-up communications? While Facebook's backend may be collecting donor information, it's worth examining how that information will eventually make its way to you. It's critical to your donor life-cycle to be able to reach out to your supporters to let them know that their contributions are appreciated. Facebook will allow you to pull up transaction reports to see who has donated. You will only receive the names they've given Facebook, and potentially an email address (if donors choose to share that information). This minimal info (lacking location, address, phone numbers, etc.) means that you could be missing out building valuable, long-lasting relationships with your donors. Plus, as of now, you can't customize your donation receipts, which is another missed opportunity to connect with people who could be interested in supporting your nonprofit further. Can charities customize the donation forms (for instance, ask: "What fund would you like to support?" or "How did you hear about our cause?") or do all organizations get the same donation fields? Facebook does not offer a traditional donation form per se; instead, a person can either click on the Page header or tap the Donate button inside a Facebook post. In the case of the former, your nonprofit can collect donations directly through Facebook but only if you're a U.S.-based 501(c)(3) organization. Otherwise you can direct donors to your own website. In the case of donations made inside Facebook itself, prospective donors just click a button and are then given the option to choose how much money they want to donate. You can even add the Donate Now option to your sponsored posts and ads. You won't be able to customize the donation experience to match your business rules. As the nonprofit behind the Facebook Page, you'll be able to fill in the Facebook post yourself, but that may limit you when it comes to both telling your story and asking critical questions of your prospective donors. How and when is the money transferred from Facebook? According to Facebook's guide, your nonprofit is paid out bi-weekly if you choose the Facebook payment option - but only after you accrue at least $100 in donations. If you don't reach that amount within the two-week span, you won't have access to the donations you did earn for another two weeks - or until you accrue that $100. Facebook notes that "funds raised from the 1st to the 15th of a given month will be paid out on the first day of the following month, while funds raised from the 15th to the end of the month will be paid on the 15th of the following month." You'll need to crunch the numbers to see when you'll receive the donations your nonprofit earned. If your organization chooses disbursements through Network For Good's Donor Advised Fund, you will receive the funds 60 to 75 days later. Are people in all countries eligible to set up fundraisers for us through Facebook? At this point, only users in the United States can create fundraising pages (and only US-based 501(c)(3) nonprofits registered with the IRS may receive the funds), although people in 39 countries are eligible to donate. How can you use the donate button? 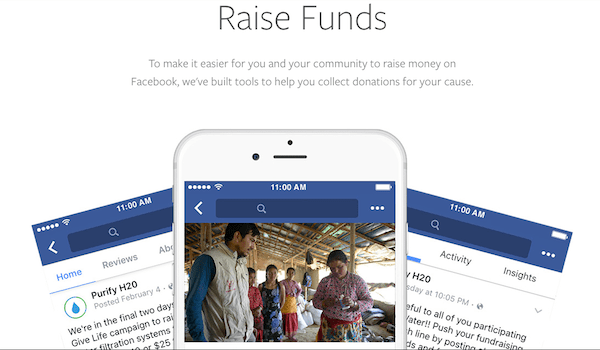 As of March 30th, 2017, Facebook has added a new update to their fundraising tools: the donate button. It comes into play when you've got a live broadcast - think livestreaming a peer-to-peer event, adoptathons, or gaming challenges. By placing the donate button directly on your video, you can enable your audience of supporters to send you donations with one simple click. You could even use the donate button in broadcasts of non-events, like campaign launches and big announcements for your nonprofit. What does this mean for our charity? More tools for fundraising are always a step in the right direction, but if capturing clean donor data and customizing the fundraising experience for donors are important to you, Facebook might not be the tool for you. Take some time and research exactly what your nonprofit requires in order to organize, mobilize, and grow. You're sure to find the right platform for your needs. Curious about online fundraising options? Check out our free webinar series to learn about peer-to-peer giving, donor management and more!